In my last post, I shared how I came about the realization that many of 4th grade and 5th grade students who struggled with mastering multiplication facts actually had a lack of number sense and lacked awareness of the patterns found in multiplication fact families. It became my mission to find ways to develop their number sense so that their multiplication fact mastery would improve. Through my research and journey to unlock multiplication fact mastery for my students and my realization that understanding patterns in fact families and some basic number sense was limited for them, I discovered that “count-by” activities could make an impact on their understanding and confidence with multiplication facts. In my experience, “count-by” activities are not often used in the upper grades (teachers may even stop “count-by” activities as early as 2nd grade as the focus turns to memorizing multiplication facts) and because of that, these activities are…. Today I wanted to share what a routine for using these number sense activities to build multiplication facts fluency in a small group for multiplication facts intervention might look like. At the point in the year where I was grappling with my students’ lack of multiplication fact mastery, I knew which students really needed these activities and who I wanted to target. You may find yourself gathering the same data without any formal assessing. However, any multiplication fact assessment and your personal observations when students are simply doing math will help you decide who needs intense intervention and which students would benefit from a different kind of focus on their multiplication facts. After assessing students on their multiplication facts mastery, you’ll want to group the students who have the least levels of mastery by either overall multiplication fact knowledge or by the specific fact families that they struggle most with. Rather than stressing over what fact family to start students on, I recommend identifying your students who struggle most with multiplication facts and simply starting them all out with multiplying by 2’s or 5’s, then moving to multiples of 4. Using the 2’s or 5’s first with your most needy group will allow them to develop an understanding of how to engage with the activities (on an easier fact family) before moving them into the multiplication fact families that they really need practice with. Later, you can differentiate the multiplication families that each individual student works with, but for now, it will not hurt them to have extra opportunities to solidify basic number sense knowledge of 2’s or 5’s before moving on to other multiples. Focusing on the 2’s and 5’s for a bit will even help students see connections in other fact families that they are missing—for example, all multiples of 2 are even (which most students “know”) so are all multiples of all other even numbers! Now that you’ve identified the students who will benefit from intervention and small group focus on number sense and multiplication facts, here’s a routine for how you might proceed using the Number Sense Activities for Building Multiplication Fact Mastery. Build more efficient strategies for “counting-by” and knowing their multiples of a fact family. I support “counting-by” to get to a multiplication fact, but I want my students’ strategies for counting by to be efficient and not based on 1-digit-at-a-time adding up. I believe that eventually the “multiple” memorization that we are yearning for will develop in our students—but I don’t want to rush them to memorization if the number sense and efficiency is not yet there. Using the student journal version of the "Which of These Does not Belong" puzzles, explain to students that one of the numbers in the puzzles does not belong in the multiplication fact family and you want them to discover which one. Instruct students to jot down an explanation for why they’ve chosen the identified number. Allow students to share their ideas to allow you to gauge misunderstandings and the depth of their understandings. Work together using Discovering Patterns to find patterns and rules for "multiples of..." the number you are working/intervening on. Continue getting students to verbalize the patterns they see. (For example, have you realized that some of your students may not realize that a multiple of 4 or 6 must ALWAYS be an even number? I had my “ah-ha!” about number sense and multiplication facts when I saw a student write 4 x 9 = 37! I've included some of the ideas students should come up with in most of the downloads. This is the time to allow students to discover their own ideas, but also to hit home ones like when the multiples alternate even-odd-even-odd, or when all multiples are even. Grab the “Which of these does not Belong?” activity cards that are formatted 4 to a page. (I print these on cardstock and put them on a ring.) As you show students one of the cards, they identify the number that does not belong. I like to have students use a white board to jot down their answer, rather than calling out, to give everyone time to process. I then refer students back to the student journal pages and have them explain how they know the number does not belong. Students can share in pairs or one at a time in the small group. It is important that we find meaningful and fun ways for students to “count-by.” Notice that these activities come AFTER working to help students develop greater number sense. In order for students to get the most benefit out of these activities, students must be required to recite the multiples in order as they are working—simply allowing them to identify the missing multiple in a count-by sequence reduces the activity to an “answer-seeking mission” instead of an intervention that will help them improve in their count-by efficiency. In “Find the Missing Multiple” (an activity that I also print on cardstock and place on a ring), students must “count-by” to find the multiple that is missing in the puzzle. I also use these in a journal page format so that students can write down their answers. I use both activities separately—first with the cards so that it’s like a game, then with the journal page. I also have my students complete “Number Searches” (like word searches). Students can complete these for morning work or in a quiet center/station. Encourage students to recite their multiples even if they know the answer to the puzzles. Multiples recitation is one of the building blocks to multiplication fact memorization. And dang…if they can't memorize a fact for whatever reason, I surely want them to be able to accurately and rapidly recite multiples WITHOUT finger-counting. You can move students back and forth between the activities until you feel they’ve really developed their number sense and made progress on the multiplication fact family that you’ve had them focus on. I also recommend returning to fact families again (whether in a small group, having students work in partners, or placing them in a math station) so that students have an opportunity to review and remind themselves of the patterns they have learned. The more practice opportunities you can allow students, the better. They can complete the same activities again and again until they are comfortable with the multiples of a specific fact family. When students are ready to move on to working with another fact family, move them along! As you move into the multiplication fact families that are more challenging—6’s, 7’s ,8’s 9’s—the pattern discussions will become richer and more valuable for students. As I continued looking for more creative ways for students to apply their multiplication fact knowledge, multiples on a number line came to mind. I decided to apply multiplication facts and multiples of numbers to a number line. I ended up designing two different number line activities that allowed me to differentiate even more for the range of abilities in my classroom. The “Find the Missing Multiple” number line cards are perfect for students who need a lower-level intervention and even more practice with their “count-bys” and fact families. These are perfect for students who need more scaffolding to learn their basic addition facts to support learning their multiples for multiplication. As a higher-level, more challenging activity for applying multiplication facts, I designed the “Which Fact Family” number line cards for students who have mastered most of their multiplication facts and/or need a more challenging way to apply those facts. In these cards, students have a number line with one of the multiples in the fact family placed on the number line. They have to use the distances shown on the number line to figure out which fact family. These cards challenge students to think in different ways as many of the cards act as multiplication fact PUZZLES that students have to figure out. Students who really have a handle on their multiplication facts get the “Division Equations” recording sheet for these number line puzzles. The “Which Fact Family?” card sets are not organized by multiplication fact families which also makes them more challenging for those students! These intervention tasks are perfect for having a volunteer work with a child as an intervention. 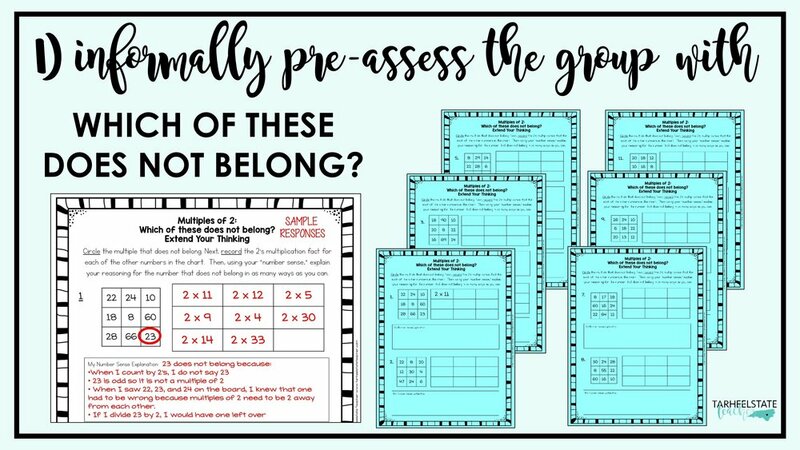 While I like to use these in a small group (to meet more students' needs), a volunteer could pull one child at a time and work more closely on the multiplication facts set that the student needs. These resources and activities could even be used by an eager parent who wants to support their child in developing greater number sense and multiplication fact fluency. Based on where students are with mastering multiplication facts, create student teams. Once or twice a week, you can give students practice time in their small groups with the activity cards. Using all of the multiplication intervention activity card sets (or combinations of sets) have students deal cards equally to one another (2-3 players) and play War or other type of game where students compare the answer they get when solving the puzzle and then whomever has the highest result (factor/multiple) gets to keep the cards. Display problems on interactive whiteboard for "bell-ringers" or when you have extra time. Have students show their answers on a white board. I designed these intervention activities on the basis that many of my students who are not mastering their multiplication facts need to develop greater number sense and to increase their "count by" speed and ability. Incorporating these activities into my math routine definitely helped many of my students overcome their lack of multiplication fact mastery. They found the activities fun and enjoyable and noticed the difference it made in their ability to think about their multiplication facts. Did you see the first post in this multiplication facts mastery series? ⇒ Using Count-By Activities to Develop Number Sense for Improved Multiplication Fact Mastery: Read about the AH-ha moment I had with one of my students who was struggling to master her multiplication facts. This moment changed everything about how I approach multiplication fact mastery—and what I do when students are struggling to “memorize” their facts—SPOILER: memorizing facts is not my goal—but developing greater number sense for multiples and multiplication fact families in a way that impacts students’ mastery of multiplication facts is! ⇒ Multiplication Patterns in 120’s Table: In this post, I share patterns in multiples of every multiplication fact family 2-12 and how I guide students to look for patterns in the multiples of multiplication facts using a 120’s table. This helpful list will support you as you guide your students to think about patterns they see, engage them in math talk, and aim to improve their understanding of multiplication facts. YOU CAN GET ALL OF THE NUMBER SENSE/MULTIPLICATION INTERVENTION ACTIVITIES FOR MULTIPLES OF 7 SENT STRAIGHT TO YOUR INBOX! Share your email below and join the rest of the Tarheelstate Teacher change-makers! Get the MULTIPLES OF 7 MULTIPLICATION ACTIVITIES sent straight to your inbox! Prepare to fall in love! I'll be sending you an email right away with a link to your free multiplying by 7's intervention activities. If you do not see an email from Tarheelstate Teacher, check your spam folder, then email me at tarheelstateteacher@gmail.com!